The Greek island of Santorini has over 500 steps to climb before tourists can enjoy the view from the very top of Fira, the capital of the island. To make sure that visitors don’t’ actually have to do this incredibly arduous climb up the steps, donkeys are used, they plod up and down the hill each and every day like some sort of animal lift system. This quite traditional ride is quite the tourist attraction, to say the least, but it does take a massive toll on the donkeys, working so hard, every day, day in, day out! Animal rights activists have released the gruesome images from behind the scenes of what actually goes on, that you don’t get to see, the tourist industry has been shaken to the core. In the baking hot day, the donkeys are forced to carry the tourists up the jill, one after the other, the paths are commonly very steep in parts and also a little dangerous in other parts. It’s not like the animals are given any kind of respite, or any kind of care, because they are not at all, animal rights groups claim also that tourists, on the whole, are getting much heavier, increasing their workload even more. It really is a job for the donkeys that have no end, not without even a little break for them, seven days a week, every week, but are they getting ample water and being treated well for their work? No apparently not!! A picture really can say far more than mere words, and to document the cases too, especially in such cases of animal cruelty, the evidence is key. 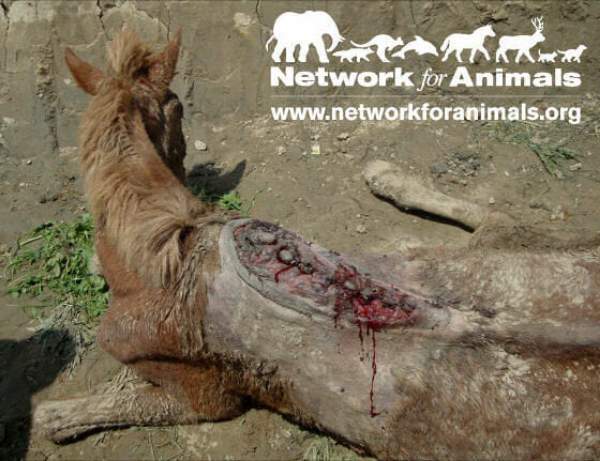 Photos from Network for Animals have now been released, they document all the bloody wounds you don’t see, the ones hidden from tourists as they book their tickets for the donkey ride. A lot of the donkeys don’t even have saddles that are properly fitted, which makes their injuries even worse, they are so exhausted by the end of the day that they can’t even get to their feet again after they finish. Even without carrying excess overweight passengers, the working conditions that these donkeys have to work in every day would still be quite tortuous, without any doubt. So what can the ordinary tourist do to help them? 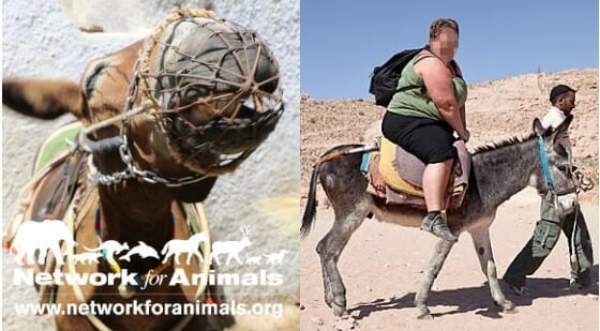 Without a market for these rides, they will cease to exist, tourists can fight against this terrible trade by not participating and trying their best to spread the word and raise awareness of the animal cruelty involved. Thankfully though, because of the hard work of animal rights activists, it’s becoming increasingly hard for the owners of such businesses to cover up the nasty results of their business. Please SHARE this and tell everyone you know, we can help the donkeys together!